I eat a ton of fruits and veggies every day. In fact, I believe that you can never eat too many fruits or vegetables. Every meal, including breakfast, begins with a salad. 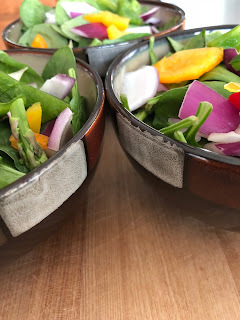 I do my slicing and dicing for salads one or two times a week and then each morning I assemble three salads, one for each meal that day. Some say breakfast is the most important meal of the day. I say fruits and vegetables are the most important meal of the day --- as many times as I can fit them in during the day I do. Vegetables are loaded with nutrients and fiber, both vital to our health. There are literally thousands of phytonutrients in vegetables and we aren't even aware of all the positive things they do for our health. But they act in concert to keep us healthy. Fruits are loaded with antioxidants that kill off the free radicals in our body. I believe that it's eating lots of fruits and frequent hand washings that have kept me safe from the flu for so many years now (and I say that with a little bit of trepidation since flu season is so strong right now and I'm not sure any of us can ever think we're fully immune to that. But if I get the flu, I truly believe that it will be mitigated by the fruit and other plant-based foods that I eat). Fruit really helps our immune systems to fight on our behalf. I start each day off with a whole grapefruit before my morning salad and then oatmeal. 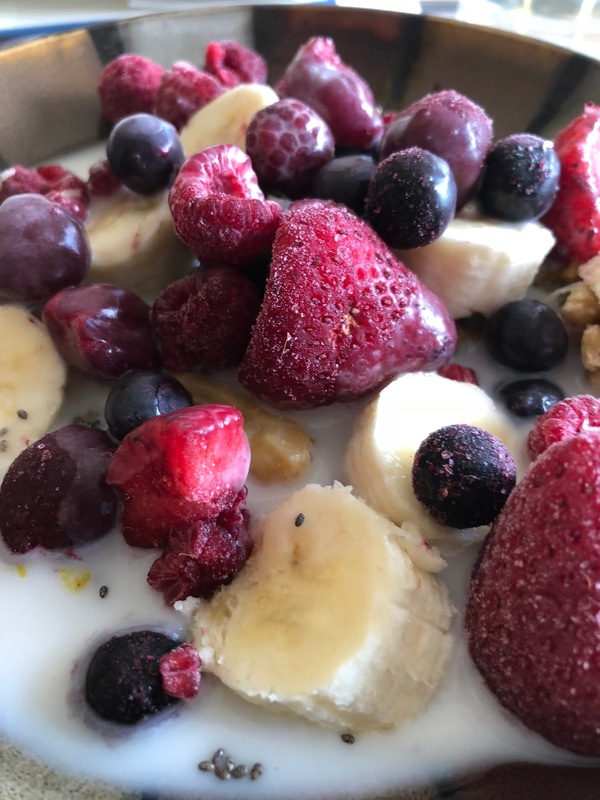 Then in addition to the turmeric, black pepper, cinnamon, amla powder, chia seeds, ground flaxseeds, walnuts and almond milk that I put on my oatmeal, I add a whole banana and a variety of different berries. Then during the day, I add a fruit to my meals for dessert or sometimes cut up and put into my salads. This is all pretty simple I think. Despite all the books and videos and cruises and conferences and cooking classes and Facebook groups that we seem to be more and more inundated with, the act of eating and following a whole food, plant-based diet isn't that difficult in my opinion. Just go to the store or the farmer's market and buy up lots of different veggies and fruits in the produce department (or in the frozen foods section if you don't like slicing and dicing) and then move over to the bulk foods area and buy up a bunch of beans, grains and nuts and seeds to complete your meals. Ignore all other sections of the store. Take your bags of goodies home with you and cook something up. And there you have it. That's everything any of us needs to know. When I shop, the produce section is most important. Second most important are the beans and the nuts and seeds. Beans are a must every day for their soluble fiber and nutritional value. And nuts and seeds are essential for their healthy fats that keep our minds and bodies at their optimal health. But I think it's a mistake to view a consistent diet of beans and rice or beans and pasta with merely a side or two of vegetables a healthy diet. To me, fruits and vegetables are what it's all about with some beans, intact whole grains, nuts and seeds mixed into that. What I don't eat much of is pasta and breads. Starch helps to satisfy hunger, but I think it's far healthier to get my starch from legumes (beans and lentils), whole intact grains and starchy vegetables like potatoes, sweet potatoes, squash and corn. Not only are they loaded with fiber, but none of their nutritional value has been stripped away. Pastas, breads and flour products, even when they're whole grain, are inferior to eating the whole food itself. And now that I'm so skinny, I don't get to eat as many calories as I once did. I would rather use what few calories I get to pack in as many nutrients and as much fiber as I can. I don't want to waste it on inferior foods. Therefore, I hardly ever eat bread, pasta or flour. Simply put, I follow the seven words that Michael Pollan came up with more than ten years ago. They are: Eat Food. Not too much. Mostly plants. In my opinion, anybody who follows those seven words will be eating a healthy diet. Everything any of us needs to know is summed up in those seven words. Everything any of us needs to know is that when we shop all the foods needed are either in the produce section or the bulk foods section of the store. And that's it.